Effective communication is essential in today’s world of business. Consistent relationship building, such as keeping a balance between strengthening relationships and building business can be tricky, but it doesn’t have to be! Relational: Transactions from people who know like and trust you. People who know you and are eager to give out referrals to you. Simply put, the difference is attracting people you don’t know versus celebrating the life of those you do know. Gayle is a real estate agent and associate broker with EXP Realty. Gayle and her husband have effective communication with their clients. This effective highly tangible communication has not only built brand loyalty but ensures them a 100% referral-based business, 50 closed homes per year all on a zero advertising budget. Relationship marketing is a new buzz word! Marketing strategy is a big deal when it comes to business. But when people hear the words ‘Relationship Marketing” they want to know exactly, what “Relationship Marketing” is. Generally, the curiosity is because of the word “Marketing.” Reason for the interest is because, marketing is a way to generate more ‘business,’ and ‘money’ which is the goal of any company. Relationship marketing is a great format, and it’s essential to have a relationship marketing strategy in today’s day and age. Matter of fact if you don’t have a strategic plan in place for building relationships in business then your falling or getting left behind. Notice ‘Relationship’ literally comes before ‘marketing.’ Building genuine, heartfelt relationships with other human beings without an attachment to marketing. Sales have transferred from an ‘Outside’ sales environment to an ‘inside’ sales environment. Whereby the time we are able to make our pitch, prospects know more about us than we know about ourselves. Indeed, in this informational world, people have the opportunity to learn about you, and your service. Whether good or bad, this information is readily available before your prospects even meet you. In today’s day and age the subject of ‘relationship marketing’ couldn’t be more critical to business owners, entrepreneurs & professional sales people no matter the industry. Hence, sales is the art of helping someone and giving back to your community. Therefore, to help and give back, our mindset should be in such a place to have a servant’s heart. Simply put, there is no better way to succeed than to bring the best version of yourself to the table. It’s definitely true that we are all capable of being genuine and authentic. In order to succeed as a salesperson, you must get to know people…period end of story! Finally, sales is about relationships, and the more focus you put on building relationships, the more successful you’ll be in business, not to mention your personal life. Larry knows and has 30 years experience in the world of the B2B technology space. Most importantly he knows what it takes to be a successful sales professional. Generate 100 referrals a quarter from word of mouth advertising! Word of mouth advertising is the best kind of advertising, and not because it’s free! Word of mouth advertising is the best type of advertising because it comes from a customer who knows, likes and trusts you. Plus the fact that it’s free is a great perk! Ask yourself this question; Do I want to generate 100 new referrals, every quarter, by word of mouth advertising? Would you also agree that there is no better way to learn than to hear it from a source that has and does generate 100 new referrals a quarter? Below is a short interview where Danielle Ratliff will share her relationship marketing secrets, that has generated 100 referrals a quarter from word of mouth advertising. Relax more, worry less and live and enjoy the moment. Relax more, worry less, and live and enjoy the moment. I am learning to do this more and more all the time. It is important to HUSTLE and make a difference in the world, do better for yourself and your family. But it is ALSO just as important, if not more important, to spend TIME (=LOVE) with those you love and build those RELATIONSHIPS, because one day, money or not, those are what you will have. Those *not there* don’t get it, those that FINALLY gave in, and tried it, and stuck with it – see those blessings. Learn from those who have done it before you – listen to the wise, don’t listen to those that are not where you want to be – emotionally, spiritually, physically, financially, etc. Follow and listen to the ones that ARE where you want to be, and do what they tell you and what you see them do. How do you feel when you are constantly being sold to? We all know it’s super annoying! Mary Kay beauty consultant Kristen Culver feels the same way. She implemented Relationship Marketing in her skin care business seven years ago. Now when she reaches out to her customers to make an order, they aren’t feeling like they are getting sold to. This week’s feature article, Kristen will explain how she takes time to reach out in kindness to build personal relationship’s with her team & customers. By doing this, her clients and team members don’t feel like just another number in the system. Her inspiring story of appreciation will prompt you to become more thoughtful in your daily communications in your business and personal relationships. In this week’s Relationship Marketing Weekly: 24 year web design & marketing consultant Laurie Delk started incorporating a relationship marketing strategy in her personal business from day 1. However 13 years ago, she was introduced to a system that not only saved her time and money, it allowed her to share her same philosophy and strategies with all her clients which allowed them to have the same results in their business. Her story will not only amaze you, but will touch your heart.. She’s one in a million! Kody Bateman: Hey everybody. This is Kody Bateman, Relationship Marketing Weekly. We are really excited for our show today. I can’t wait to jump into this interview. We have the beautiful Laurie Delk coming out of Nashville, Tennessee, a 24-year veteran web designer and marketing consultant, working out of your home and created an incredibly successful business. Laurie, welcome to the show today. Thank you for being with us. Laurie Delk: Thank you. It’s an honor to be asked to be on the show. Kody: We sure love that smile of yours, girl. I mean you just – you got a bundle of energy coming from you and we’re so excited to hear from you. I would consider you to be one of the top master relationship marketers in the world today. I mean some of the things that you do to build your own business and to living your home life are absolutely incredible. We want to bring those stories out today in this interview. Man, I hope you’re all taking good notes because Laurie has got incredible information for us today. First of all Laurie, 24-year veteran web designer and marketing consultant. Can you just tell us a little bit about what exactly you do? What do you provide for your clients? Laurie: Yeah. So 24 years ago, I started out just basically creating basic websites. That was before programs were even out to create websites. So I did all the hard coding and graphics and then marketing when we got on the internet and then now I actually have several clients that I run their – it’s like web-based project management systems. So anything that they have to do with their business on the internet, I run that and head that off and take care of it. Kody: So what kind of marketing efforts do you use? I know you do a lot on Facebook. So you do a lot of online stuff. You do a lot offline stuff. Most people listening right now, the first thing they always want to know is this sounds like an intriguing business. How do you acquire customers? What kind of things do you do? Just quickly. Laurie: For me to get customers, it’s 100 percent referral. I don’t advertise anywhere. 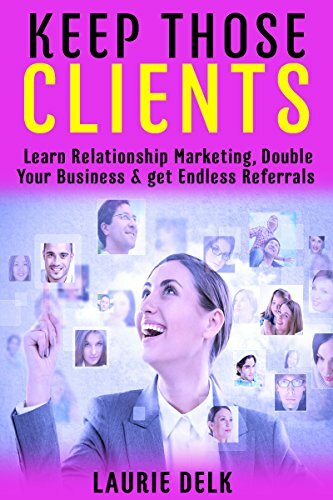 The only marketing per se that I do other than posting on social media really is keeping in touch with people and other clients that I’ve networked with refer me to other people. Kody: OK. So 100 percent referral business. Everybody is always interested in that. I don’t care what profession you’re from. If you can generate 100 percent referral business, that’s a huge thing. So obviously people want to know how you do that. Again, you’re a master at relationship marketing. You’re a master at reaching out and connecting with people on Facebook as well as offline. One of the things I really want to talk to you about Laurie is – one of the things I’ve learned from you is that you reaching out to people is – it’s who you are. It’s what you do. There doesn’t seem to be any lines of whether a person is doing business with you or whether you just met them somewhere. You do these things for everybody. Can you just talk to us a little bit about that? I mean I want people to feel your heart because I think it’s important. Before we even get into the business side, it’s important that people understand that what you do is in you. I mean this is just who you are. So could you just share that with us? Laurie: Yeah, I do. I believe in spreading happiness and kindness no matter what. So if people do business with me, great. If they don’t, that’s great too. We can still be great friends and I can still send them happiness through the mail and digitally through Facebook and other social media too. I try to connect with people every single day through – I have a thing where I text 10 people a day and just say, “Hope you have a wonderful Wednesday!” or a terrific Thursday, something cute like that. I send messages like that on Facebook through messenger or sometimes directly to their page and then sometimes I post a selfie saying that to everybody. But yeah, I try to just connect with people. If I can get their mailing address, I also send them cards and sometimes gifts through the mail. Then I always send birthday cards if I find that out. I try to snoop and find that out or ask them sometimes. Kody: So let me ask you a question. When you do all of that, are you trying to get business from those people? Kody: So you do it just to do it. Now Laurie, this is what I hope that all of our guests that get on this can understand. You do those things to do those things. You do those things without any expectation, anything in return. You do those things for the sake of being kind to other people, period. That’s why one of our guests before talked about being intentional with your relationships and that’s what you do. This is what we are trying to teach the world is that if you do this, all of your business stuff takes care – that’s how you get 100 percent referral business. You just be nice to people for the sake of being nice to people. You are so good at that. I mean that’s one of the things I love most about your example is that you truly are that. You genuinely do that. Let’s jump in to a couple of key things here. You do a lot on social media. You talk about how you reach out to – can you just walk us through the process of what you do every day on social media to reach out to people? Laurie: Yeah. So my day is very busy. So I am very much into the time blocks. So I schedule two – usually two 15-minute time blocks on social media and so in that 15 minutes, I do 5 minutes of – I post things. So I post positivity, a cute quote that I read that day in my devotions, something educational, and then sometimes something that’s marketing also. So I do that, the 80-20 rule. So it’s like four posts that I do that are educational or motivational or spiritual and then sometimes one marketing post and then the next 5 minutes, I read messages and get through all my messages that I can and then the last 5 minutes, what I do is – about once a year, I download all my data from Facebook. So you can go into your settings and download that, all your friends and all your followers. So then I copy and paste that into a notepad and 5 minutes, I take a couple of people and I just take their name and I go to their page and I like a couple of things, comment, If they posted a picture of something, you know, with their kid playing soccer, where they won a game or something, that I download those pictures and then I send their kid a congratulations card with a pack of brownies or something like that. So that way I’m connecting with them and then I erase them from that notepad, so that way it goes through and I end up getting through every single person that’s on my Facebook because I have the 5000 friends and the several thousand followers after that. So I don’t see all those people in my newsfeed because I don’t stay on there that long. So this way, I’m at least connecting with everybody at least once a year. Kody: Wow! You could do a full day seminar on what you just said. I mean that was such a great quick recap of some really powerful activities on Facebook that you do. That’s just incredible stuff. I really appreciate you sharing that with us. I’m on the receiving end of a lot of what you do. I mean I’m friends with you on Facebook. So I see these posts and every time I see a Laurie Delk post, I’m intrigued. It’s like, “OK. What’s Laurie going to share today?” and that’s because you’ve done it consistently for so long that I know that what you provide is going to create value for me. I’ve also received greeting cards from you in the mail. I’ve received cards from you before just celebrating something or sometimes celebrating me or saying thank you to Jodi and I for something. So I’ve been on the receiving end of what you do and it’s incredible. I mean it’s magical, that process. So let’s talk a little bit about the offline – by the way, time blocking. I think we need to touch on that a little bit. I find that so many people – we get in the habit where we spend way, way, way too much time on Facebook because you have a tendency. There’s a habit of, “Oh, I got a couple of minutes right now. Let me check my news feed,” and 45 minutes later, you’re still messing around on Facebook. So I love that you time block and I think that’s great advice for all of us is to time block and get very – you get very specific about what you do during your time blocks, which is really powerful stuff. I appreciate you sharing that. Offline, you do a ton of – you talk about thank-you cards, birthday cards, greeting cards. You talk about gifts that you offer sometimes along with those. Can you walk us through that process a little bit on – because again, you send a lot of greeting cards out, not necessarily for people that you’re doing business with. You’re just again reaching out to people in kindness. So walk us through what you do there. I also do a lot of networking and then I meet people one-on-one outside of the networking and so then I send them a card saying, “Thank you for your time,” and send them like usually two packs of brownies or some sort of gift with that. So little things like that and then also for – I always try to find out people’s birthday, their anniversary. I send cards at either Thanksgiving or Christmas or sometimes right in the middle to kind of do both and then I do another one like at the beginning of the year. So sometimes I pick St. Patrick’s Day or Easter or spring or 4th of July. So I can just create like a campaign where I create a card one time and then I pick the groups of the people – I always put all my people in different categories, in different groups in our contact management relationship system that we use. That way, I can pick out who I want to send them to and then click the button and 5000 cards go out all at once. Kody: Well, I’m glad you brought that up, that there’s a system that helps you do this because when we hear you say all these things you do, it – people listening right now, I mean it sounds overwhelming. It sounds like that’s all you do all day every day is send cards galore to people everywhere. But you actually have a system that helps you do that. In fact, you’ve sent over 80,000 greeting cards in the last 13 years to people in your life, whether you do business with them or not. You’ve just given us the examples of how you do it. Can you break down for us – I mean how much – again, you’re a big time blocker. How much time a day do you spend sending cards, just on average? Kody: Well, that’s amazing. On average 15 minutes a day turns into 80,000 cards over the course of 12 or 13 years. So that’s what – hopefully the message that we convey here is that with systems like we have – and you use a system called SendOutCards. With systems like that, you’re capable of time blocking and doing this. Now do you do it – because I know you’re very modest and you don’t like to share your success. But you run a very, very successful consultant business and – what other kind of marketing do you do? Kody: So this is it. This is all you do. Laurie: Yes. I don’t do any – I don’t pay for any other type of marketing at all. I send out cards and keep in touch with people and yeah, whether they do business with me or not. A lot of people that I even send cards to are in the same business with me or where they wouldn’t do business with me, with what I do, whether it’s web and graphics design or in the send-out-cards business or anything that they wouldn’t do business with me because they already do what I do. But I still send them cards because I’m still building that relationship and I totally believe what goes around comes around and what you give out comes back to you and it has worked. So I keep doing it. Kody: Very much a habit for you. It’s in you and you can’t turn it off. You just keep doing it in 15-minute time blocks a day and that’s what you do. In fact another interesting stat that you shared with me earlier, in 2016 – everybody listen to this. This is crazy. In 2016, you sent close to 10 packs of brownies, just a little gift. There’s a little gift that the SendOutCards system allows – and there’s all kinds of gifts. But one of the big selling gifts is two packs of brownies in a beautiful box and they can go with the greeting card. You sent close to 10 packs of brownies every single day the last year. Kody: Who are you sending these to and why? I mean what? I mean that’s amazing. So why are you doing that? Laurie: Well, I’ve always said that I love to send out happiness through the mail. So that’s what the cards – I always try to – any card that I send, I want somebody, when they open it, to smile. So I don’t want it to just be a “blah” card. I want them to enjoy it and be happy and feel that emotion when they get it. The brownies are yummy. They’re just so yummy. So you can send a two-pack and it’s super convenient and economical and I just decided one year that – that that was it. That I wanted to do more than just a birthday card and so I decided that every birthday I had come up, that I was going to send two packs of brownies with it. So in my contact manager that I have, I have between 5 and 15 about birthdays every single day that come up in my database, that remind me. So yeah, so I just decided that I added two packs of brownies with the campaign. So it was already set up for me and I just clicked that button. But that way, everybody got not just a card but they also got a nice gift from me. Kody: Wow, that’s incredible. I’m going to act on a prompting right now as we close the show up and I don’t mean to put you on the spot. But I feel prompted to do so. Laurie, you are – people watching you right now, you’re a bundle of positive energy. You’re happy. You do amazing things every day to please other people and to bring kindness into people’s lives. Obviously we’re in a world today that desperately needs that. You resonate kindness from you, happiness from you, and you’ve been through a great deal of trial in your life in the last five or six years. You have dealt with adversity that would break most people. I just feel compelled to kind of close this right now and – if you would like to share what you’ve been through, that’s fine. But just how do you go through such adversity like I know you’ve been through and resonate the kind of joy that you resonate on this call? Can you just share with us what makes this – so you can be like that? Laurie: Yeah. So I’ve had like seven major heartaches in the last five years from losing my husband, to my mom, and several people close to me. I actually tell a lot of my walk and my book that is being released this week actually called We All Have Choices and that said, I was so blessed with a mom who raised me to have that positivity mindset and then of course the people that I’ve been allowed to be around and attracted into my life the last several years helped me to feed me that mindset and still have moments obviously. You know, when I first got the news of my husband being killed in a car wreck, all that positivity pretty much went out the window. But still it just – because I live that so much every day and I read and I – in the bible, it talks about that Paul encouraged himself in the Lord and David encouraged himself in the Lord. So you have to encourage yourself. You have to lift yourself back up. Pick yourself up by the bootstraps and move forward. So I know how important that is and like for me, I know – you know, not only do I know that I have a lot of people that watch me and follow me. But even more so importantly, I have children that are watching how I react to these situations because they’re going to have situations in their life that one day, they will have to react to. So I just know how important it is to find some sort of positivity, something that you can be grateful for. One of the things I do is every day in my gratitude journal, I write five specific things for that day that I’m thankful and grateful for. So when I do have those moments and I go to my bed and cry, I can pull out my gratitude journal that’s right in my nightstand next to my bed and I can read through thousands of pages of all these things that I have to be grateful for to make me get back to that positivity mindset and make me realize what I can be thankful and grateful for because there are so many things that God has blessed me with in so many different areas. So even though I might walk through some sort of tragedy that I might not be so happy with and I might not understand and who knows, might not ever understand until I get to heaven, I still can trust the fact that I’ve been blessed in so many incredible different ways that I need to stay focused on being thankful and grateful for that and that’s – and what you think about, you bring about. That was one of my mom’s favorite phrases and she used to tell me that. I mean from the time I was little, that I could walk, I remember her saying that. So I totally believe in just making my mindset think and focus on the things that I want to attract into my life. So I believe that helps and has helped me to help other people that have ended up walking in the same shoes as me. Kody: Well, Laurie, you’re a great example. We appreciate your stories. We appreciate what you provide for the world today. We’re in such need of the kindness that you provide and even walking through adversity and you’ve shared with us some really cool things that you can do to stay in the positive, which is so important in the world today. So thank you very much for being on the show. We really, really appreciate you. Next week, you may want to tune in next week. By the way, those of you who are watching this, just get back with the person that shared this with you and they can share with you more about the system that Laurie uses and how it could help you in your business and in your personal life as well. We’re about bringing the human race together and we’re going to do it through kindness. So we have a way to do that. We’re excited about it. Next week, we have a very special guest, Jordan Adler. Jordan Adler is a highly successful network marketer and author, very well-known in the network marketing and entrepreneurial profession and best-selling author of the book Beach Money. My goodness, you want to be on the show because he’s going to share with us how – what he does in his network marketing profession, what he does as an author, and how he shares and teaches other people how to be kind using relationship marketing principles. Great show for all of us to tune into next Wednesday, Jordan Adler. This week, Laurie Delk, thank you very much. Again, your book is titled We All Have Choices. Where can we find that? Where could someone get a copy of that? I know I’m excited for it. Laurie: It’s on Amazon, We All Have Choices. 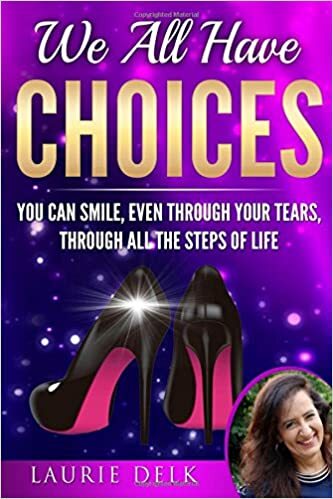 Kody: We All Have Choices by Laurie Delk. It’s on Amazon. Please go and get a copy today. Thank you Laurie. Thank you everybody for tuning in. We will see you next week. Take care now.